Jakob Cross retained his Armageddon Cup in Wellington, defeating three men to hold onto the title on the first day of the Armageddon Expo. Cross came up against perennial tournament finalist and the man he defeated to win the cup in Hamilton, James Shaw, in the quarter final stage of the tournament, and made an example out of the fan favourite. Shaw kicked out of Cross’ swinging side-slam, the move he used to become Armageddon Cup Champion in Hamilton, and Cross struck Shaw down with a British Buzzsaw. Instead of opting to cover Shaw, Cross nailed him with the British Buzzsaw again, and again, and again – six times in total – before the referee stepped in and called off the match. With Shaw unable to continue, Cross was declared the winner and advanced to the tournament semi-finals. Wellingtonian Johnny Idol was unable to stop Cross and, just like his long-time tag team partner James Shaw, also fell victim to the British Kaiju, sending Cross to the tournament final. With TK Cooper now opposing Cross in the last stage of the Armageddon Cup tournament, it would become a matter of the Agents of Change versus TnT, the Investment versus the Origin, as well as a prestigious title match. Cooper, one half of the IPW tag team titleholders, looked to be on track to become a dual champion when he dropped Cross with his Rock, Paper, Scissors Kick, but IPW Director and Investment head Daniel Burnell took issue with the result. A second referee had had to count the pinfall after the first referee was accidentally hit with TK Cooper’s superkick. This referee was not sanctioned to officiate the match, Burnell said, and as such the match should be restarted. As soon as the decision to restart the bout was made, Cross drilled Cooper with his swinging side-slam and covered him while the initial referee slowly made the count, allowing the Investment to have the last laugh and keep the Armageddon Cup within their portfolio. The main story to come out of Westpac Stadium on the second day of the Wellington Armageddon Expo was the humiliation of Brook Duncan. After being forced to kiss James Shaw’s feet at Auckland Armageddon last year, and being covered in make-up following another loss to James Shaw in Hamilton last week, Duncan attempted to settle the score with Shaw once and for all on Sunday. Unfortunately for him, a series of losses left him barely recognisable at the end of the day. The pair’s first match of the day was fought under the unique stipulation that the winner would be able to select a new name for the loser, which they would have to go by until 11.59pm that night. As has been the case in their previous matches, Shaw picked up the win, and, after polling the crowd, Shaw decided that Brook Duncan’s new name would be “The Prettiest Girl in Wellington, Lady Boy”. After having to compete as Lady Boy in the annual Armageddon Rumble (won by Johnny Idol), Duncan challenged Shaw to a double-or-nothing contest in the second session of the day. Whoever lost would have to be known as Lady Boy, and also wear a dress until the next day. Once again, Shaw pinned Duncan, and he was forced to put on a dress. Instead of cutting his losses and walking away, Duncan opted to go triple-or-nothing and challenged Shaw to put his hair on the line in a winner-take-all scenario in the final session of the day. As readers may have guessed, Duncan was unsuccessful for a record-fourth time, losing to Shaw after a burning hammer. Interim IPW Women’s Champion Britenay and Carmen Rose then joined Shaw in the ring to shave “Lady Boy’s” head. 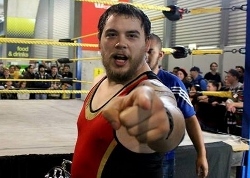 Travis Banks concluded his undefeated Armageddon weekend with the help of a celebrity guest on the third and final day of the Wellington Armageddon Expo. Michael Rowe, Deadshot from the popular TV2 series Arrow (Thursdays, 8.30pm), served as the special guest ring announcer for a tag team match pitting James Shaw and Travis Banks against Jakob Cross and Liger. Cross and Liger, the Agents of Pride, double-teamed Shaw early into the contest and left him injured on the outside of the ring. The two then set about breaking down Banks, who was finally able to counter a double-STO with a DDT, but had no one to tag in. Deadshot left his position next to the entrance way and ran over to Banks’ corner to accept the tag from the IPW Champion, and hurtled into the ring where he surprised Cross and Liger with a series of clotheslines. Deadshot then scaled the top rope and leapt fearlessly onto both of his opponents, taking them down in the middle of the ring. Once again heading to the top rope, Deadshot lined up a precision elbow drop and dove onto both Cross and Liger, before covering them to score the win for himself, Banks and Shaw.